Thales’ strategy of developing its industrial footprint in India is in line with the Indian Government’s ‘Make in India’ policy to develop the industrial defence base of the country. 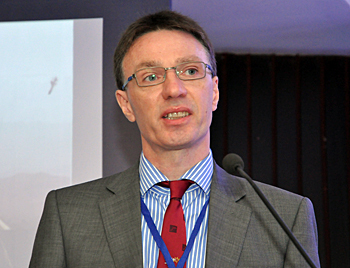 Patrick Mallon, Chief Technologist and Senior Thales Expert in Missile Systems, in conversation with Neetu Dhulia of SP’s M.A.I. SP's M.A.I. (SP’s): The air threat envelope has become more challenging in the last few decades. What is your perception of current and future air threat? Patrick Mallon (Mallon): Over a period of time, air threat is increasing exponentially both in range and altitude. Due to the rise of air power which initially started with fighter/bomber aircraft, air defence has evolved. From past several years, attack helicopters, unmanned aerial vehicles, cruise and ballistic missiles became part of the air threat. In the Indian Army’s vision of the future, the army must progress into a modern net-enabled force, which is capable of providing air defence protection to field forces and strategic assets against the complete spectrum of air threat. SP’s: Do you keep the above air threat in mind while planning your air defence systems? Mallon: Thales holds decades of experience and is active in anticipating the future threat; working with customers to provide the next generation of effective solutions. Thales has been working with customers to address evolving threats through Thales Advanced Air defence solutions that ensures timely decision-making and effective responses for the protection of military forces, key assets, nations and citizens around the globe.Thales is providing its customers with solutions and services that truly meet their needs. We do this by applying all the technologies and innovations that have made us world leaders in the sector.Thales, has a unique capability to design, develop and deploy equipment, systems and services that meet the most complex security requirements. SP’s: What do you feel should be optimum mix of ground based air defence systems in terms of guns and missiles or only missiles with multiple ranges? Mallon: An optimum mix of ground based air defence systems would be in terms of guns and missiles that would allow better target engagement. As you are aware, missiles can take targets at a longer range and are more accurate. They are faster and with the new technology, they can manoeuverthemselves to engage the target. On the other hand, guns are effective to take targets at a shorter range, have a faster reaction time and are relatively economical. SP’s: Do you offer any air defence gun systems? Mallon: Thales’ RAPIDFire is a gun system adapted to both vital assets and fixed points defence, as well as mobile troops or convoys protection missions. This mobile, multi-role weapon system is designed to respond to the new threats being encountered by armed forces today and in particular the low cost targets which can attack in swarms and can saturate conventional missile defences. RAPIDFire benefits from 40 years of Thales’ background experience in field proven Weapon Systems for French and overseas Armed Forces. With its powerful antiaircraft gun, high performance 3D radar and versatile C2 module, RAPIDFire is optimized to defeat all types of air threats including Fighter Ground Attack (FGA), helicopters or Unmanned Air Vehicles (UAV) and cruise missiles or precision guided munitions. Thales also has electro optics such asand fire control radars such as Flycatcher Mark 1 and Mark 2, Pharos, among others, which are integrated with gun systems for better accuracy. SP’s: Star Streak is a short range air defence missile offered by Thales. Can you give some details like range, guidance system, anti- air threat capability, variants for various platforms like land, vehicle, helicopter, tank and so on. Mallon: STARStreak High Velocity Missile was designed to provide close air defence against conventional air threats such as fixed wing fighters and late unmasking helicopter targets. Thales has addressed the needs of military users around the world and introduced major improvements to provide increased range beyond 7 km, increased coverage and altitude and improved guidance precision against small targets. STARStreak has been designed to defeat these threats quickly and effectively and provide a vital capability in force protection. STARStreak is a truly versatile missile and is most effective when dealing with targets with short exposure times. The key features of STARStreak are its proven capability against air targets, immediate launch capability - no seeker cool, down or lock-on required, high precision laser beam riding guidance which is immune to all known countermeasures, low signature rocket motor with short burn time, low laser beam energy levels ensuring no warning to target, automatic cut down capability for missile in flight (to avoid fratricide), zero maintenance missile - no in service support, precision strike/low collateral damage and insensitive Munitions (IM) compliance. STARStreak can be launched from the Lightweight Multiple Launcher (LML) and Thales RAPIDRanger. SP’s: What about medium range missiles from Thales? Mallon: In the domain of medium range missile systems Thales is a member of the EUROSAM consortium. EUROSAM is delivering the Medium range Surface-to-Air SAMP/T system. This system is qualified and has unequalled capabilities of interception of air targets and tactical ballistic missiles. Both missions can be performed simultaneously. Thales is also delivering the engagement control function for medium range surface-to-air missiles in the naval domain. This includes a command & control systems and multifunction radars. SP’s: Thales has a big presence in India for Army air defence radars, with Flycatcher Mk1 and its upgraded version being the mainstay of the Army. What are your future plans to take this cooperation to the next level of radar systems? Mallon: From decades, Thales has been offering the full scope of its defence expertise and experience to the Indian armed forces. Thales technologies allow the Indian Armed Forces to better protect the country which is their first mission. We would continue with our support to the Indian Armed Forcesand facilitate its goals of self-reliance in defence equipment and modernization including the next level of radar systems. Thales looks forward to provide an upgraded and tech advanced radar systems for air defence. SP’s: Are you offering AESA radars along with the technology? Mallon: The GS100 radar is under delivery to the Indian Air Force for the LLTR program. GS100 is part of the successful Ground Master family (including GM60, GM200, GM400), the air defence radars reference with more than 100 radars sold worldwide since 2008. It is equipped with an active array using the most advanced Gallium Nitride components for transmission. A comprehensive Transfer of Technology to Bharat Electronics is ongoing so that a number of GS100 radars could be produced in India. SP’s: What about ground based air defence systems for the Indian Air Force(IAF) as the Army and the IAF jointly implement air defence in India. Mallon: As shared earlier, we are providing radars to the Indian Army. We look forward to offer our solutions as per the requirements that would come up in the future as well. SP’s: Do you offer C4I integrated air defence solutions? Mallon: Thales is offering world-class scalable Solutions and Servicesfor Air Defence and Air Operations based on Thales equipment or integrating legacy or third party equipment in Open System Network Centric Architecture while committing to overall system performance. SP’s: Will you offer the technology for active seekers for missiles to India? Mallon: Wherever our customers need our support, we are there and will continue to offer our flagship solutions that suit the requirement. SP’s: Can you tell us about missile and sensor systems of Thales which can be employed for the Indian Navy and the IAF? Mallon: Thales has been a trusted supplier to the Indian Navy and IAF.We have already provided anti-submarine warfare sonar systems and mine-hunting solutions as well as long-range surveillance radar DA04 and LW08 for the Indian Navy. We continue to closely follow their requirements. SP’s: Thales has its presence in India since 1953. What are your plans to participate in the vision of Prime Minister Narendra Modi of ‘Make in India’? Mallon: We firmly support the ‘Make in India’ campaign that translates the government’s vision of making India a global manufacturing hub. 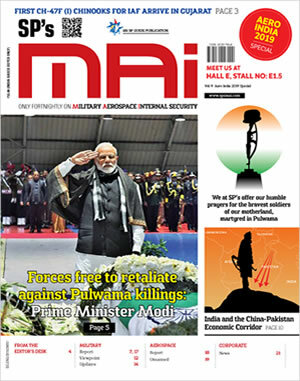 The initiative bodes well for the industry, thereby paving way for the country to become a defence exporter.Thales’s strategy of developing its industrial footprint in India is in line with the Indian government’s ‘Make in India’ policy to develop the industrial defence base of the country. The company has been actively contributing towards transfer of technology. We have been closely working with Hindustan Aeronautics Limited (HAL) for over 50 years now, in all technological areas that can be used for military aircrafts. Also, our association with BEL dates back to its inception, i.e., over 60 years ago.The JVs with BEL and SAMTEL along with L&T Technology Services in the fields of civilian and select ground-based military radars, military avionics and airborne sensor systems, and avionics software respectively further reinforce our commitment to India. Further, through its “Go to India” approach, Thales has also been co-operating with the Indian private sector particularly large corporate players and SMEs to build transfer of technology and supply chain partnerships.